BouffÃ¨es de Fromage: Also known as cheese puffs. But give me a minute here. I’m serious. The light flavor of the white champagne was – seriously – a nice compliment to the artificial, powdered cheese. And the bubbly kept the air in the puffs (or should I say “bouffÃ¨es?”) whistful, even whimsical. Yeah, artificial cheese powder can get whimsical -Â you betcha. I know you’re laughing, but we went back for more Target brand cheese puffs (yes,Â we even asked)Â – 2 times. I’m sure Argentinian wine is delicious, but Charcuteries de 7-Eleven aka Slim Jims just are not. Sorry, folks, when I visit 7-Eleven and I feel like beef, I’ll get the Pemmican Beef Jerky at the very least. Trust me, I’m an expert on 7-Elevens; I live behind one. 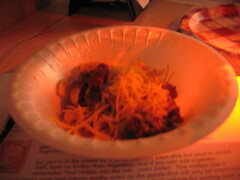 The Frito Lays topped with “Cincinnati-style” chili and cheese was hands down the most appetizing of the food bunch – and we were hungry. 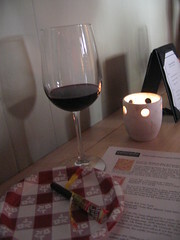 The red that accompanied it was a pleasant dry and spicy variety to really nicely bring out the kick in the chili. And of course, the cheddar cheese that topped the concoction made it an instant match since, well, what matchÂ withÂ wine isn’t made more perfect with the addition ofÂ cheese? Great pairing! Ahh…dessert. Yeah, I know the picture is dark, but that’s a little Ding Dong in the corner there. Granted, our palates were, after artificial cheese, meat and Fritos, ready for a couple sweet somethings to soothe our taste buds. 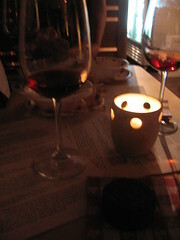 The Ding Dongs brought back memories from a sack lunch childhood but were enhanced by a very delicious port wine that was subtle and not too overpowering. It went down smoothÂ and was like spiking the Ding Dong! It was a unique experience and definitely something I’d try again – if not just for the novelty. But all the pairings did match (okay – even the Slim Jim to an extent) quite expertly and for $20, it was a fun afternoon at a bargain. 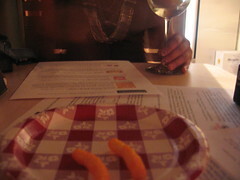 This entry was posted in East LA, Food, In the life and tagged eagle rock, los angeles, taste testing, white trash, wine pairing. Bookmark the permalink.